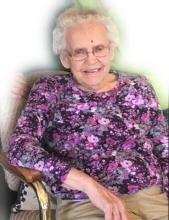 Donna J. Warner, age 87, of Glenwood Twp., WI. died Monday November 26, 2018 at her home in the Twp. of Glenwood. Donna was born March 10, 1931 in the Cylon Twp, WI to Carl and Hazel (Fredrick) Thompson. Donna married Frank Warner on October 14, 1950 and together they operated a dairy farm in Glenwood City for over 50 years where they raised 6 children. She was fortunate to remain in her new home in the country with her poodle, Tera. She loved cheering for the Twins and Packers and visiting with family and friends. Anyone who knew Donna, knows how much she liked babies. As a child, she always offered to babysit. This love showed true to the very end, where you could see her beam with visits from the grandchildren and great grandchildren. She also enjoyed traveling with Frank and other relatives and later in life with her children. Some of her favorite trips were to Maine in the fall, Calgary Stampede in the heat of summer and to Walton's Mountain in Virginia. All of the traveling left Donna and her family with t-shirts, mugs and wonderful memories. Donna is preceded in death by her parents, husband Frank, Sons Michael and Bruce, infant son Frank Jr., brother and sister Carl Thompson Jr. and Ilene Rothe and infant twin brother. Donna is survived by Children; Donald (Connie) Warner, Debbie (Gary) Stevens, Nancy (George) Stutter and Penny Warner. Daughters in law; Cindy Warner and Bobbie Warner. Grandchildren; Chad Warner, Justin Warner, Samantha Hetchler, Heather Greene, Holly Malack, Heidi Olson, Katie Warner and Bill Warner. 13 great Grandchildren and 1 great great grandchild. Brother and sister; Kermit Thompson and Mary (John) Luhman. She is further survived by many nieces, nephews, other relatives and friends. Funeral services will be held 11:30 Friday November 30, 2018 at the Trinity United Methodist Church in Deer Park, WI with Reverend John Hazen officiating. Burial will be in the Greenwood Cemetery Emerald, WI. Friends may call the church Friday from 10 a.m. until services. Local arrangements by the Anderson Funeral Home in Glenwood City, WI. To send flowers or a remembrance gift to the family of Donna Jean Warner, please visit our Tribute Store. "Email Address" would like to share the life celebration of Donna Jean Warner. Click on the "link" to go to share a favorite memory or leave a condolence message for the family.